Before going to India, I visited a travel clinic in Canada which provided me with three things: an armful of vaccinations to prevent hepatitis A & B, typhoid and tetanus, a course of tablets to prevent malaria and finally, an antibiotic for ... when ... I got food poisoning. "Boil or peel food before eating." "No, you'll just last longer. After that, you take these." I wondered how long I was expected to survive. Could I reach the guest house from the airport? Or should I be wearing an adult nappy upon landing? Would I be viewing the Taj Mahal through a periscopic lens extending from my sick bucket? Was India secretly a biological warfare camp designed for the breeding of super-humans and therefore uninhabitable by the weak, normal masses? When I anxiously arrived in India, I told the group of friends who had come to meet me about my culinary instructions. "They told me I was doomed!" The response was a shaking of heads, "We don't think that's true." Encouraging, but if they were all secretly super-humans perhaps they just didn't understand danger. The strategy I ultimately decided on was a simple one: take some basic precautions but then don't worry about it. My guide book suggested sticking to vegetarian dishes for the first few days, since meat dishes are often very rich which can in itself produce an upset stomach. Fortunately, eating vegetarian in India is far from being a hardship, with roughly a third of the population doing likewise on a permanent basis. Indeed, the first record of a vegetarian diet comes from ancient India around the 6th Century BCE with its popularity stemming from a religious-based advocate of non-violence towards animals. As a result, vegetarian dishes in India are numerous and delicious. Never had I visited a country with more choice for non-meat courses and the only hardship was reminding myself that I did want to try the meat before I left. For the first three days, my friend and I ate in fairly formal looking restaurants. They were not wildly expensive --although certainly pricier than the many street vendors around the city-- but being in a proper sit-down establishment seemed a sensible tactic for minimising bugs I might not be able to handle. In India, people eat with their hands. In Northern India, where wheat rather than rice is grown, naan breads accompany the main dish. Strips of bread are pulled off the naan and used to scoop up the meat, beans or sauce before the combined bundle is popped into your mouth. Traditionally, only the right hand is used for this process, with your left hand sitting idly by your plate. Even though I was assured that using both hands or a fork would not be offensive, I tried hard to follow the example of the people around me. Since this didn't involve a new skill such as wielding chopsticks, I thought this would be easy. The first problem was that I am left handed, but I'm not convinced this made a huge difference. Managing the entire routine above with only one hand is an impressive feat, independent of your limb of preference. The second problem was a willingness to get dirty. To successfully eat a meal in this style, you have to be prepared to really get your hand into the food. This is a very alien concept to someone used to using cutlery or chopsticks, both of which keep your bare hand at a significant distance from your plate. In theory, I was a keen participant, but I could see that I ended up using only the tips of my fingers and ultimately spilt more food over the table, my face and sometimes my lap. It was very hard to resist the urge not to wipe or lick fingers during the meal, but to regard that hand as a write-off until the meal's end where a finger bowl would appear. The food itself was amazing and actually very similar to the higher-end Indian restaurants in the UK. While I knew the UK had pretty much adopted Indian cuisine as their own, you never know how much a dish has been altered to suit a different population. Possibly my favourite meal was a huge rolled up bread stuffed with potato called a 'masala dosa', a dish from my friend's home in Southern India. It was quite the miracle I did not also have to be rolled out of the restaurant after consuming it. The level of spice in the foods varied a great deal. We stuck to the lower end, partly through conscious choice but also just through the dishes I happen to select. My conclusion was that no one should be worried about visiting India if they are wary of hot foods; there is enough variety to suit everyone's palette. 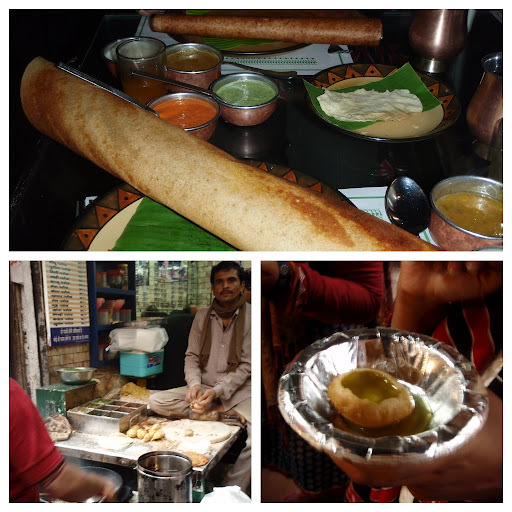 On the forth day in Delhi, we visited old town and ate at a street restaurant. This was a moment of truth, since while the stuffed naans were of renowned greatness, they were being made right there on the street which screamed gut troubles with every bread-turn. Just to make it clear I was laughing in the face of danger, I had a tangy dessert from a street vendor. ... and I was fine. Actually, given my irritable bowel syndrome, this meant I was considerably better than usual. There was only one possible conclusion to this: I was quite clearly also an INVINCIBLE SUPER-HUMAN! See that goat? I could eat it right off the street, hooves and all! Crunchy. All and all, it was probably a good thing we were on a rickshaw by this stage, heading back out of the town. Disaster did eventually strike two days later, in the early morning of the day I was to fly to the UK. It was not a big problem; I woke up with my stomach aching and had to tumble out of bed to the toilet. After I recovered, I noted I was low on toilet paper and thinking this had the potential to end badly in the face of a second attack, I went to ask at reception for a new roll. It was about 6 am when I nudged the security guard awake. He did not speak any English and assumed I wanted to check out of the guest house. While I understood the initial confusion, I did rather feel that --upon taking a step back-- he should have realised that the bare-footed, pyjama wearing girl before him, brandishing an empty roll of toilet paper, did not really look ready to get into a taxi. But no, this seemed entirely plausible to him. He took the empty toilet roll from me and put it to one side. He lifted the check-out book. I ignored the book and re-claimed the empty toilet roll. "Oh, you need more toilet tissue!" After that, all went smoothly and by the time we touched down in London, I was right as rain and ready to make myself really and truly sick through the sheer number of chocolates in the house over Christmas. Bliss. On an unrelated but frankly, awesome note: Thank you to Mynx for giving me a blog award from her own awesome site! My son and I love Indian food and there are a couple of half decent places near us. I went to a festival once in Darwin where there was food eaten by hands. If I remember right, I chickened out and used a fork. Eating a meal as an impromptu guest in the hovel of a home of a poor Turkish family was part of a long story I wrote for Mynx and a friend of hers. It's too long to go into here, but it's an experience I'll never forget. Don -- what is the normal way to eat in Turkey? I was only there for a day and ate kebabs so... well, I just picked up the skewer! Nishachor -- that's really interesting! I can sort of see how moving from using your hands to keeping everything at a distance on a long prong would be quite odd. I actually really liked the idea of eating just with hands, but I found it very hard to get used to food covering my fingers without very impolitely licking it off! Elizabeth: When I ate with this poor Turkish family the adult males ate before the lady I assumed was the old man's wife and the boy I assumed was their son were allowed to eat. I didn't speak their language nor they mine. We sat on a carpet on the floor with a table cloth spread before us and ate what I think was supposed to be some sort of soup from a large hand-carved wooden bowl everyone ate from by dipping a home-made bread (that I thought at first were napkins) into the bowl and then eating the bread. It was difficult to eat whatever it was without gagging while appearing to be grateful for the food and their hospitality giving me shelter from the horrible weather after our vehicle got stuck in the mud. I'm often rather amused by colleagues who head to clinics to get countless vacinations prior to going to India. The same colleagues spend their time in fancy hotels and offices where the infrastructure - and by implication hygiene standards - are second to none. Of course, if you are planning on eating in dodgy joints and drinking water from dubious sources then the situation is quite different. My approach visiting India as a child was to stick to boiled or bottled water, and only to eat warm food from known sources - and never encountered any problems despite not having taken the usual travel cocktail of vaccines. These days I take more liberties - but then I can see that refrigeration standards are better now than they were in the 80's and 90's.